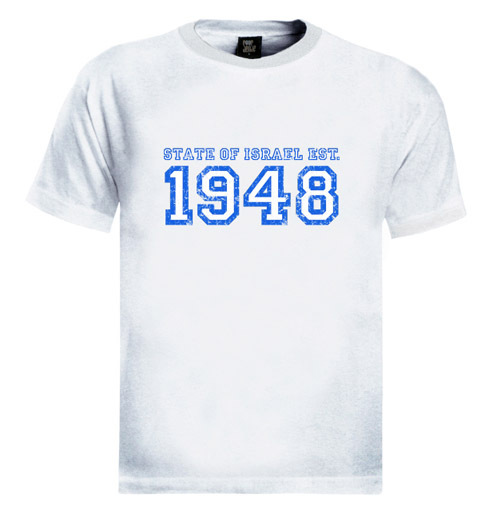 Keep the date the modern state of Israel was founded close to your heart with this men's Israel T-shirt. The shirt features two lines of text across the chest: 'State of Israel Est.' in small letters over the year 1948, inlarge, eye-catching numbers. The text is in white with a bright blue outline and a sporty font. This crewneck cotton shirt is available in black, white, heather gray, royal blue, or turquoise. Fans of Israel will like this design. 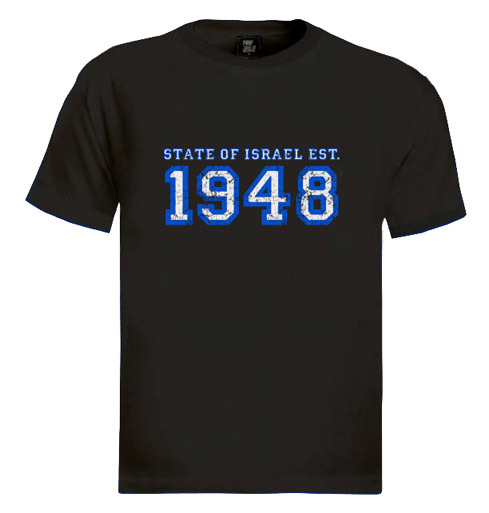 Israel-themed T-shirts have long been a popular souvenir of visits to Israel and make great gifts for friends and family. Our T-shirt themes cover all trends related to Israel and Israeli culture, especially the popular IDF T-shirts and T-shirt designs featuring Mossad, Israeli Special Forces, and Israel Air Force-related designs. 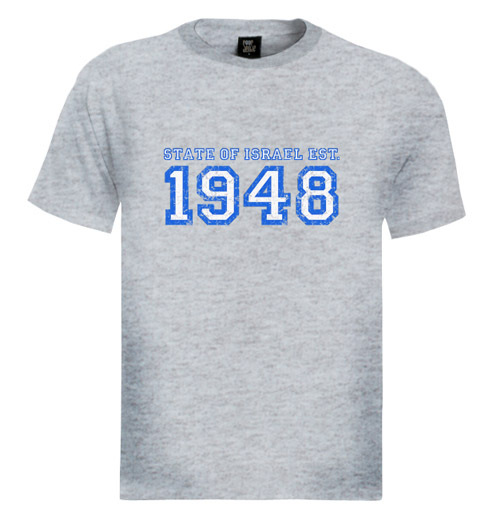 Our basic crewneck Israel T-shirts are made of 100% preshrunk ring spun cotton. This fabric is slightly more expensive than other kinds of T-shirt cotton because of its special softness and high-quality cut and weight. We are committed to using the best quality materials available to make our shirts and showcase our Israel T-shirt designs on our men's and women's tees. Note: 100% cotton T-shirts may shrink up to one full size when washed, even if preshrunk. Please follow the washing instructions on the label.